Website design security consultants Norfolk VA | Forgery experts, fraud consultants online branding has Website Wow Factor. This artfully designed website uses duo-tone black and blue photography to emphasize the key areas of forensic analysis. 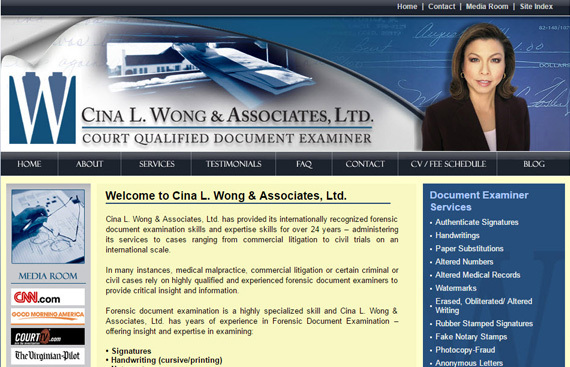 Cina Wong is certified in handwriting analysis forgery of fraudulent documents: foreclosure, will and estate, bank checks, contracts. VISIONEFX provides Web design for security consultants and companies. When searching Web design Norfolk Virginia look no further than VISIONEFX for all of your website needs.